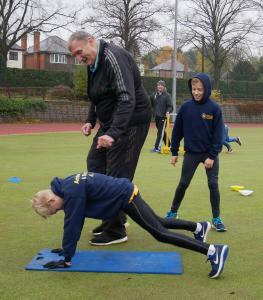 It was in the 1960s that Bob Boyd, of Belper, first started coaching - and he's still going strong at the age of 69. During that time, Bob has held down several busy jobs, but always found time to continue his coaching journey across a number of sports. He currently works part time for Learn by Design (the education arm of the By Design Group), which delivers a range of interactive workshops on sport, STEM, motivation and teamwork, as well as the Get on Track programme with the Dames Kelly Holmes Trust and groups of NEET youngsters. Now semi-retired, he has previously been in teaching, including two headships and a role as an inspector. He still does some supply teaching on an ad hoc basis, and is a diet consultant from home. "I started coaching while at school back in the 1960s. By the age of 18 I was playing for and coaching the local second XI soccer team. I coached my first athlete into the top six in the country in school year 1966-67, in the discus. "I then trained as a PE teacher and thus, throughout my career, I have coached a wide range of sports in the schools where I was teaching - and always did this even when in senior management." Bob takes a core winter training session for athletes. "In athletics, I have coached numerous athletes to national and international level, including all the throws, high jump, 400m hurdles, and also a national cross country champion. I have been throws coach for various County Schools squads, including Derbyshire. "I have coached various soccer teams, including school teams, club sides, both junior (such as Belper Sports) and seniors, as well as the South of England Independent Schools Under-16 squad from 1980 to 1985, playing against academy sides from Chelsea, Arsenal and West Ham. "In rugby, I have coached various club sides (including Belper), as well as Oxfordshire Schools Under-15s and Essex Schools Under-16s. "My experience in cricket includes coaching school teams, the Berkshire Schools squad, including two lads who went on to play for Hampshire, and who both currently coach professionally. "I coached school teams to county basketball success in Oxfordshire and Surrey and coached county squads at both these counties in the Under-16 and Under-19 age groups. From 1997 to 1999, I also coached the juniors and seniors at Belper Leisure Centre. "I have also taught swimming at various schools and at Belper Leisure Centre between 1996 and 1999." "I have picked up a steady stream of coaching qualifications in athletics (1968), soccer (1969), swimming (1969), basketball (1969), MLC (1969), cricket (1985) and rugby (1990). It followed on from some success as a sportsman myself, winning the English Schools' discus and finishing first UK athlete at UK National Championships. I went on to represent England at the Homes Countries International in discus, shot and hammer, where I was team captain. 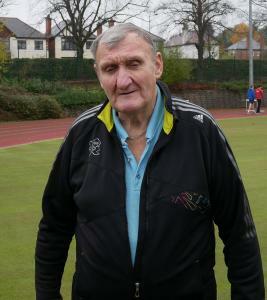 "I was also a keen club competitor for 50 years, representing Midland Counties and British Colleges from 1968 to 1970. "Alongside this, I played local soccer when time allowed including for a team that won the FA Veterans' Cup Final (over-40s) in 1987 and 1989, as well as rugby for various club sides, including Wasps, Derby and Belper veterans, cricket for various local and representative sides and basketball at London League level." Bob has been devoted to coaching all his adult life. "I have learned numerous new skills since I started coaching, including how to use sports science and the latest technology to good effect. "I've also become much more positive - back in the day we often highlighted the negative rather than the positive - and I've learned to be much more inclusive in group coaching. It makes things more difficult for the coach, but also more interesting. "Now, I always try hard to listen to the athlete and include them in the plans, plus I try to learn ideas from others." "For me, the best thing about being a coach is helping people to improve, which makes them keener to continue in sport and thus enjoy themselves and stay fitter. On occasions, it's also great producing a champion individual or team. "Coaches and volunteers in sport and physical activity are hugely important! The top of the pyramid (Olympics, professional teams etc) only exists due to the enormous base that is sustained by the numerous volunteers who organise and run clubs and teams and coaches who support them. 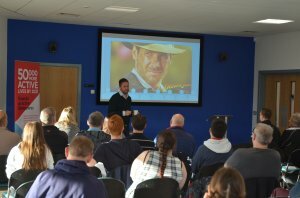 Bob attended the recent Derbyshire Sport Coaches' Conference to continue his learning. "What keeps me coming back to coaching is knowing how much pleasure I get from helping others -the reason I went into teaching - and knowing how much I got from sport. "I want to give others the opportunity to have the same enjoyment and success to their own level that I have." 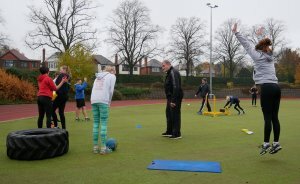 "I'm still looking to improve as a coach and talking to other coaches, listening to athletes, reading and attending courses - I recently went to the Derbyshire Sport Coaches Conference - all helps. "My advice to others who are thinking about getting into coaching or volunteering is that you have to be keen and enthusiastic. If you want to do it to make yourself a 'name' then forget it." Athlete Lily Naylor in action. Natalie Sims - From scratch to third in England high jump Under-17 women, from Noel Baker School, Derby in 1997-98. Fabian Foster - Played rugby for South East England Under-15 and went on to play first class rugby in France. Brother Adrian went on to play for Northampton second XV. Simon Catchpole - Won the National Cross Country Championships at Roundhay Park, Leeds and went on to represent England at the World Cross Country Championships. James Boyd - Won England Independent Schools high jump and played Under-16 rugby for Essex and Eastern Counties (Bob's son). Lucy-Ann Boyd - Won England Independent Schools shot put (Bob's daughter). David Anderson - Competed in the 400m hurdles at the Edmonton Commonwealth Games in 1978. Julian Wood - Won a place on Lord's ground staff and went on to play for Hampshire CC. He is now running the JW cricket academy and 'power hitting' system utilised by a number of counties and first-class cricketers. 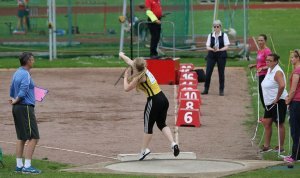 Lily Naylor - ICON athlete currently ranked at number six Under-15 shot putter in the UK.